Everybody wants to go abroad whether for business purposes, professional work, to meet relatives or for holidays. Well, whatever may be the reason to go out, there is no reason to make a phone call your loved ones. You can call your friends and family when you want without any reason. But, how will you make a call? You will need a new number or a WiFi connection to make calls through social media apps. However, arranging a SIM card as early as possible is very difficult. But, you don’t have to worry when you’ve the Nomad Phone with you. Nomad Phone is an iOS app which lets you use your US or Canadian phone number anywhere in the world. You can get a new phone number in minutes, create a second line, or transfer an existing number to use in the app. With this app, you’ll be reachable by a domestic phone no matter where you are! It provides a reliable number that stays consistent while crossing borders and changing SIM cards. The app works over Wifi or data and notifies you of any calls or texts you might have missed when you were offline. The app is easy to use without any irritating advertisements or hidden fees. While travelling the world, Nomad Phone makes it easy to run your business, talk to the clients, and stay in touch with your family and friends. Nomad Phone offers a free 7-day trial and after that you’ll be chargeable @$9.99 per month. This includes one active phone number and access to all premium features. If you want to port the number, you’ll have to pay a one-time fee of $12.99 because it’s available as an in-app purchase and you will be eligible for a Free 14-Day Trial. You can add subscriptions or cancel anytime in the Account settings. All the subscriptions will be charged to your credit card through your Google account. Also, they will automatically renew unless canceled at least 24 hours before the end of the current period. You can avoid roaming fees by calling and texting over WiFi or a local or international SIM card. You can reduce your phone bill as there are free incoming and outgoing calls to the US and Canada. You can send unlimited messages as you want with free texting to the US and Canada. You can get a new phone number of your choice. You can transfer your existing number to use on NomadPhone. You can save your time with the voicemail transcriptions. It has a call forwarding feature so that you can never miss a call. Overall, Nomad Phone is a great app for all the travelers from the US and Canada. Please check it out! It’s available on the iTunes Store and is compatible with the latest version of the iOS. 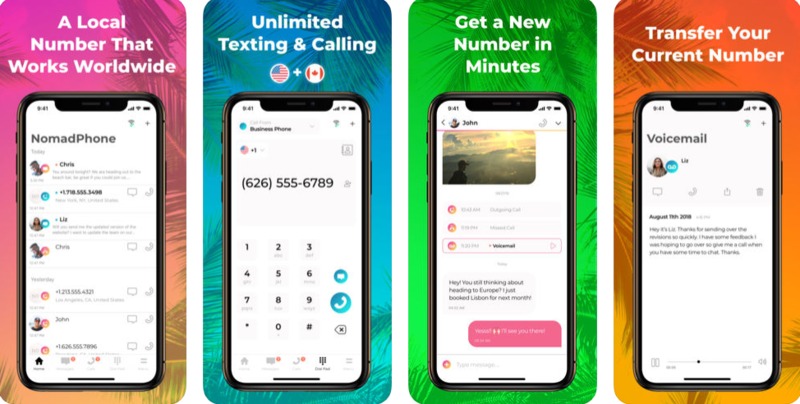 Pros: amazing app; avoid roaming fees; reduce your phone bill; unlimited messaging; get new phone numbers within a few minutes; keep your number also; call forwarding feature; voicemail to text; less expensive.